This is the first edition of our “Views from the Ground” series. Campfire Innovation is based in Greece and often visits projects, camps and key locations to identify the challenges faced by volunteers and refugees and the best smart solutions deployed. This is a is a collection of stories based on the places we visit and the people we meet that inspire us. 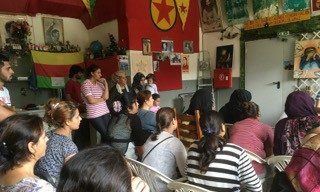 On Wednesday 21st of September 2016, I went with Peggy Whitfield and 3 other volunteers from RefuComm to the Kurdish Centre at Lavrio, an official government camp. Peggy had arranged to give a talk on the Asylum procedure to the refugees there. We were greeted warmly at their community centre by several of the residents. One of RefuComm’s translators explained our visit as we were offered seats and tea. We hung out for a while talking with several residents as others went about organizing a group of people to attend the talk. Eventually, 20 women and a few men gathered together for Peggy’s presentation. I later learned that most of the women had husbands in Germany and wanted to be reunited with them. Peggy Whitfield is quite an engaging and dynamic speaker. She cares about the refugees and their need for accurate information. Peggy is clear, articulate and passionate. Although her presentation was translated by their Kurdish volunteer, it’s not necessary to speak English to see how much Peggy cares about her work. The community centre is a very comfortable place with people drifting in and out, getting tea, chatting with each other. It’s decorated very brightly with pictures of various Kurdish heroes from many hard fought battles. The television had ongoing documentaries of Kurdish fighters, especially women fighters. The Kurds are known for their strong women warriors. It was immediately evident how much pride they felt about their battles for freedom. The Centre appears quite well run and self-organized. The only evidence of an NGO was the UNHCR. We saw no outside volunteers or other NGOs. After an hour and a quarter, Peggy finished her presentation and we were promptly given more tea and invited for lunch. It was a very simple meal, apparently prepared by a catering company in the usual airline style meal packs. We were treated with a great deal of respect and cared for as a generous host would care for guests. Table wiped clean, silverware and napkins set out, glasses of water poured, bread set out and food (rice with raisins) heated for us. It never ceases to amaze me how people with so little are willing to share it with others. My heart fills with gratitude at these generous acts of kindness.